Premier Li answered questions from World Economic Forum founder Klaus Schwab and had a dialogue with business leaders. During a meeting with business leaders, Premier Li said reform is the fundamental driver of China’s economic development. 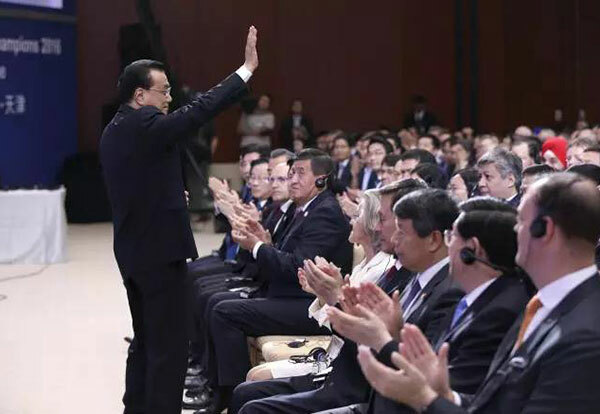 Premier Li Keqiang delivered a speech at the opening ceremony of the Summer Davos Forum in Tianjin on June 27. Premier Li Keqiang highlighted reform and innovation to upgrade growth during his visit to companies in Tianjin. Premier Li has called for the forging of “hundred-year-old brands” among China’s traditional enterprises during a visit to a Flying Pigeon bicycle experience store. The sharing economy has huge potential in China, where the younger generation are ready to embrace new ways of living, senior management of Airbnb believe. China’s economy is decarbonizing fast as it has made building a clean, low carbon energy system a priority for the upcoming five years.